February was quite busy here at Euro-Divers Velidhu as we had a lot of divers and on top we got a visit from the diving group “Seetuefel” (devils of the lake) from Switzerland. 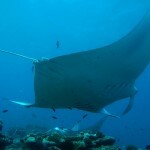 They were 11 divers and wanted to enjoy with us the underwater world of the Maldives. Despite of quite strong wind and rough sea we did a full day trip to Fishhead, Maaga Inside Corner and Hafza Thila and everybody enjoyed this 3 dives. Of course, we also were lucky enough to find all the small critters like Nudibranches, Flatworms and Shrimps on our reefs. Can you spot the shrimps in this picture?